Abi Lake is a Manchester based artist. Her current work combines traditional dressmaking skills with contemporary performance practice, to create sculptural garments & installations. I have recently had two pieces of work exhibited at the Gallery of Costume, Manchester, ‘Elvis is my Mum’ & The Paper Dress. Both of these pieces are informed by my on-going interest in the history & performativity of women’s dress- The stories we tell, & the environments & identities created through what we wear, & how we wear it. ‘A hand stitched and ever-growing garment, layered with leaves and stained with memory. ‘An exploration of notions of ‘family’, in all its many layers, colours & guises. 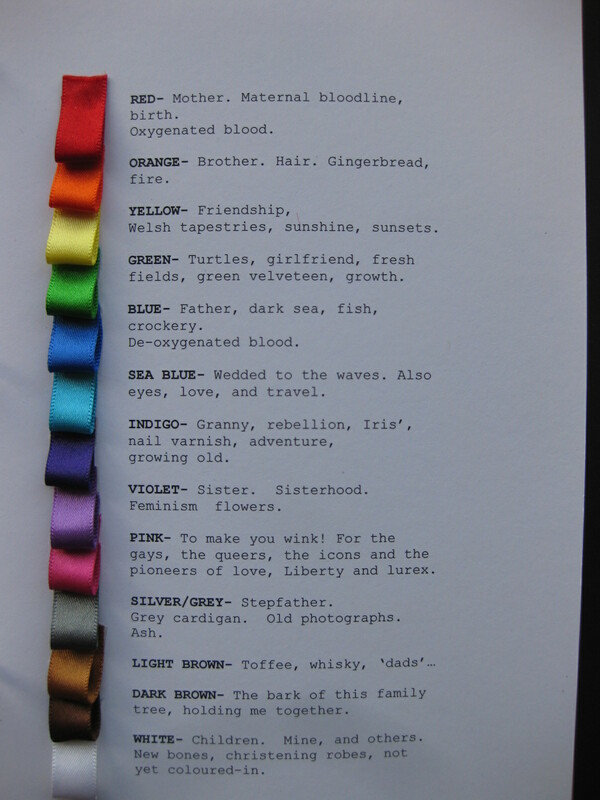 The ribbons spreading from the corset form a fluid rainbow of branches, connecting to different family members. Elvis is my Mum, image shows detail from the fabric 'sample book' accompanying the exhibition. 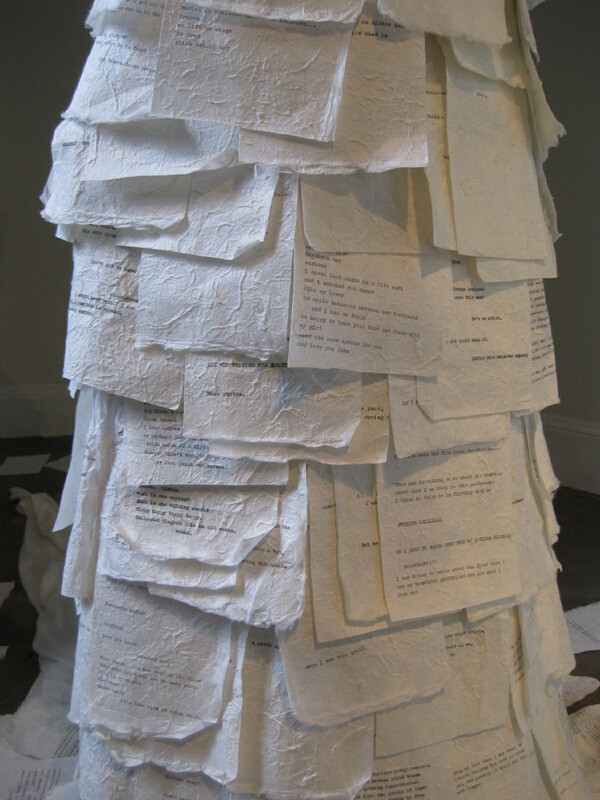 First created in 2003, The Paper Dress has been added to, performed & exhibited every year, at various venues since then, & most recently at The Gallery of Costume, Manchester, 2011. I am currently developing a new project inspired by the form & fibre of trees, in relation to the human body, & experimenting with notions of gender representation through fabric & form. I will be exploring concepts of ‘drag’ & camp, through rigorous design processes, in order to create expressive sculptural garments & installations, as well as sketches & writing, in response to this. 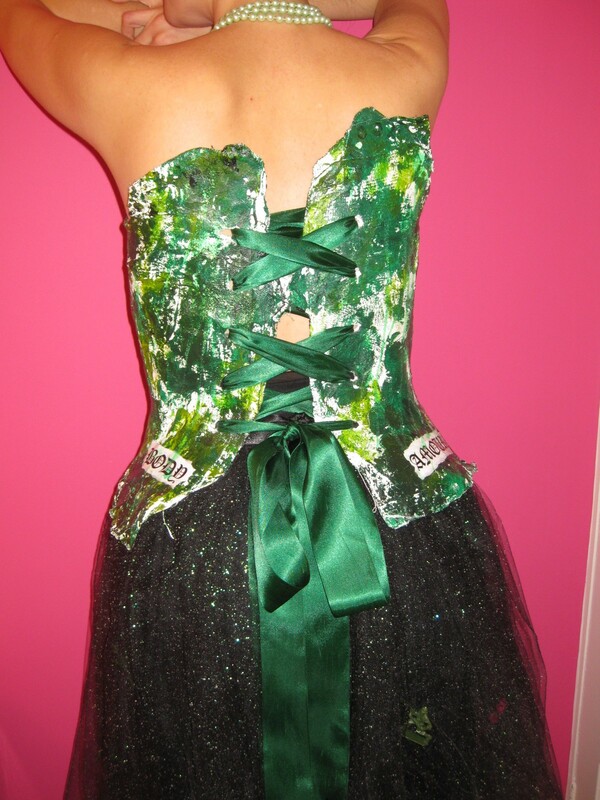 Plaster cast corset, with satin ribbon lacing, & glitter tulle skirt hiding green army men & pink barbie accessories.